Situated in the northwest extremity of the North American continent, Alaska is one of the best business-friendly environments, servicing both small and large companies. This American state’s economy is dominated by oil, natural gas, fishing and tourism industries. It also offers the best legal protection to incorporations. If you think you can handle well the low temperatures in Alaska, then here are the state’s incorporation requirements. In most cases, forming a company is the necessary first step which allows a non US resident to open a bank account. Internet commerce is made much easier with a US bank account, because this gives you access to a debit card, and the potential to open a merchant service account. Companies such as Paypal, Amazon and EBay considered you more qualified as a vendor. Whether starting a new business or incorporating an existing one, incorporating makes a business appear more credible to potential customers, suppliers and investors. You also have the security of operating under US law. Alaska requires that a C corporation or an LLC must not have a name that is the same or could be confused with a business already in existence. To make sure your business name is eligible Inc. Plan can help you with choosing a unique C-Corp or LLC name. A unique corporate name enhances your company’s reputation and also helps protect the identity of your brand. There is no residency requirement in Alaska. You or your directors do not have to live in Alaska to own or operate an Alaska company. However, before your firm is legally eligible to operate, you will need all the required filings, business licenses, permits, and tax registrations. If you need help, Inc. Plan can help you through the bureaucratic process. Both C-Corps and LLCs must have one or more members, but the names and addresses of directors are not mandatory to appear in the Articles of Incorporation or the Articles of Organization. Only the CEO or Vice-president is allowed to sign the biennial report. No incorporation age restrictions are imposed by the Alaska Secretary of State. Limited liability corporations must have distinctive names ending with “Limited liability company”, “LLC” or “L.L.C.” . Moreover, the term “limited” can be reduced to “Ltd.” , and the word company to “Co.”. LLC names including words such as “Bank”, “Banking”, “Banque” or “Insurance” require state approval and designations such as “Borough”, “City”, “Municipality” and “Village” are forbidden. If you decide to incorporate an LLC in Alaska, then you must file a formation document called the Articles of Organization. The information that must be listed on this report varies from one state to another. The Articles of Organization must contain the name and address of a registered agent who resides in Alaska, available to receive and manage legal and tax business documentation. LLC owners must also file an initial report within six months of incorporating and a biennial report by January 2 of the year following the incorporation process and two years after. Alaska doesn’t charge LLCs for personal and business income. However, LLC owners may choose to be taxed as a C-Corp for federal tax purposes. The flat fee for the biennial report is $100, but additional fees may be applied if the report is not filed by February 1. The state also requires an EIN for Limited Liability Companies which hire employees and for opening a US Bank Account. Each of the 50 American states has its own requirements for incorporating. The most essential requirements for C- corporations established in Alaska are as follows. 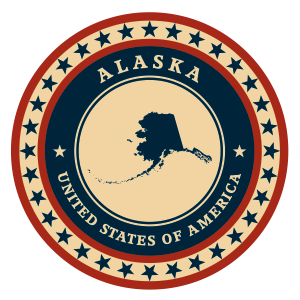 In Alaska, the permitted name designations for corporations are: “Corporation”, “Incorporated”, “Company” or “Limited”. Also, you can use the abbreviations: “Corp.”, “Inc.”, “ Ltd.”, “Co”. Also, if companies want to use “Bank”, “Banking”, “Banque” or “Insurance” as an corporate name, they must seek approval. Names including “City”, “ Municipality” and “Village” are prohibited. In order to form a corporation in Alaska, entrepreneurs must file a document of formation called Articles of Incorporation. This is filed with the Division of Corporations Business and Professional Licensing. Additionally, by January 2 of the year following incorporation, businesses must submit their first biennial report on their activity. It is not mandatory for officer and director names and addresses to be included in the Articles of Incorporation. However, Alaska corporations must list the name and address of a registered agent with a physical Alaska address. Also, shares and per value must be specified in the Articles of Incorporation. Inc. Plan (USA) can help you with the necessary filings and also with qualified registered agent service and other mandatory requirements. The state of Alaska enforces no individual income fees or sales taxes for C-corps. However, corporations are subjected to income taxes imposed on their entire taxable revenue. Additionally, the fee for filing the biennial report is $100, and if the first report is not submitted by February 1, corporations may suffer penalties. If you plan on hiring employees, Alaska law will ask you for a tax identification number (EIN).